NutriO2 Review: A Nonsensical SCAM! You are here: Home / Blog / NutriO2 Review: A Nonsensical SCAM! NutriO2 by ‘Kevin Richardson’ is one of the most insane scams I’ve ever seen. 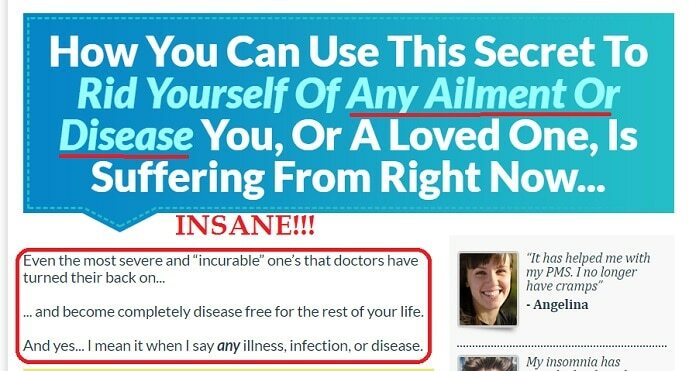 In this short review I’m going to expose all the absurdity that characterizes this product which, by the way, is owned by the same guy behind known scam Pure Natural Healing! What an insane claim, right? And by the way, this same claim was also made over at Pure Natural Healing. Basically, NutriO2 works by delivering oxygen to your body cells. In other words, NutriO2 is an oxygen supplement available in drop form. To further demonstrate the level of the absurdity of this product, NutriO2 is taken by mixing two drops in 15ml of water. For those that do not know, water ALREADY contains oxygen. This means that whenever you drink water, you are basically taking the ‘liquid’ form of oxygen. So what is the sense in taking oxygen drops? According to Kevin, NutriO2 contains ‘ more bioavailable’ oxygen. Translation: the oxygen in water cannot be used by the body. Well if that is the case, then how do fish survive in water? Common sense, people. Common sense. OK. Let me pause here and jump to the main reasons why NutriO2 is a scam. Kevin Richardson calls himself ‘a natural health researcher and practitioner.’ Well that’s a lie because he is just a stock photo you can buy at Shutterstock.com! The photo looks familiar, right? This is because it is the same photo passed off as the ‘author’ of Pure Natural Healing. Oh … and Kevin Richardson is the author. ‘Martha’ is a stock photo available for sale at Shutterstock, Fotosearch, Dreamstime and CanStockPhoto. Like I mentioned earlier in the review, the fictional Kevin Richardson guaranteed that NutriO2 will literally cure you of any disease imaginable. That’s a pretty huge claim, akin to someone claiming that he is God – the only Being who actually heals every disease. Much to nobody’s surprise I presume, there is absolutely no single evidence that NutriO2 works. The few real testimonials are hugely negative. This product allegedly delivers extra oxygen to body cells via liquid drops, which is unheard of in the medical world. Since we breathe in oxygen through our nose and not ‘eat’ or ‘drink’ it, I wonder how the scammers came up with this absurd idea in the first place! Final Conclusion: DON’T BUY NutriO2. It is A SCAM! To set records straight, the ONLY way of taking supplemental oxygen is through inhalation. You CANNOT buy pure oxygen over the counter because it is a dangerous drug. For those that do not know, excess oxygen is highly toxic to human cells, as it reacts with almost any chemical in the body to product highly reactive free radicals, which then go ahead to wreak havoc on your body, causing you to age faster among other bad things. Most of the ‘oxygen in drops’ supplements out there have not been proven to be safe. So I advise everyone to stay away from any ‘oxygen supplement’ being marketed online, as they are not worth your money! The oxygen in the air you breathe is more than enough for your body. As always, feel free to use the comments section if you have any contribution to make. Also, don’t forget to share this article if it has helped you – spread the word so that no one will fall for this scam. Thank you! Really just avoid like the plague. I cannot believe people can do this and think that they are able to get away with it. It is nothing shy of disgusting. The Paleo Reboot team is sending this garbage out to all their subscribers via email……singing its praises. That’s what got me to start researching it – had never heard of it before. Wife and I used / use NutriO2 for about 2 years before wife passed away. 15 drops in cup of clean water 2 times a day just like instructed to do. With all of wife’s health problems I do believe NutriO2 gave her a years more life with me. We were together 44 years. I will continue to use NutriO2 as long as I live. 1. Which O2 component in water is available for metabolising? 2. Why the O in H2O is not available? 3. What factors reduce the availability of O2 in water? 4. How the O2 in water can be increased? Consuming H2O2 is dangerous – it leaves “holes” in your stomach. Ask any naturopath. 15 drops x 3 daily make a hole – nothing like trying it out!!! In the right amount it is beneficial. I buy it from my nutural store from my naturopath. The difference is amount of oxygen! 2 molecules of hydrogen and 2 molecules of oxygen makes a BIG difference. Next time use iodine natural one, I use to be involved in manufacturing of a natural iodine some 40 to 50 yrs ago, I could write an essay on how we helped animals as well as people, with various conditions, there is a technique on the use iodine, which is the secret sauce of it’s use..but I certainly don’t want to write an essay, so take care.. I’m listing a video url if permitted that I will be addressing more on iodine and other reliable natural health possibilities. Would be interested in seeing that video Bob. Me too I am interested in the video. Bob – Please post the video url for the use of iodine. If NutriO2 is a scam, why do you allow replies posted that praise it? Two of three posts praise the supplement, wouldn’t most people 66% conclude that NutriO2 is the answer to all of their problems? I allow the comments for the sake of fairness and transparency. I don’t expect everyone to agree with my review. Anyway, I’ve received more feedback for this review through the Contact page than the comments, and 100% of them agree that it is a scam. It’s so sad to see that people like you can be so easily deceived by fake testimonials. Just so sad. From your own admission, you seem to be a pretty dumb person who can’t even finish reading a review before posting a long comment blasting the reviewer. Just to let you know, I am NOT a guinea pig, I’m a health professional who can determine whether a health product works without trying it. Given how dumb you look from your comment, I’m pretty sure you didn’t realize this before posting. If you want to try the product yourself, then go ahead. I’m actually expecting your results and I won’t be surprised if you claim that NutriO2 cured your AIDS. I totally agree with R. Jay! If this Ossai is a medical doctor then he is part of BIG PHARMA so that is why his biased attitude!! You’re all a bit crazy, If this stuff was. the medical cure it promises, folks, IT WOULD BE FRONT PAGE NEWS! Snake oil is back again: Cures diabetes, asthma, cancer, aids, ADHD, and on & on. Oh, really? Come on folks! James Champ, An amazing story and recovery. Please tell me how you were able to cure your Non-Hodgkin’s Lymphoma in 40 days? Well Mt Ossai, if this is the way you respond to your commenters, my opinion of you just hit the toilet. I don’t know if this product works or not, but decided to try it after your post to Mr Jay. I can’t believe your a real health professional after the way you responded to him. Calling someone a dumb person because they disagree with you is uncalled for. What are your credentials snyway? I,too would like to enow exactly what kind of health professional you are,, what degrees you have and from where. You comments only in this one review reveal that you have very limited knowledge of the science upon which the product is based. Wow, the way you’re spouting off makes you look like anything but a professional. Pethaps a trial is in order. At the very least you can post with unbiased certainty your own findings, and maybe shut us all up. I agree this is most likely a scam, however, a health professional shouldn’t be telling people things like that, like he has aids and stutff like that. Or calling him stupid. I agree he should have read the whole thing, but I also think it should have been tested by you as well. I am just looking for me help , rather desperately, for my ailing father. So people will believe things like this, and I am glad I found your review. I was so desperate to believe it, I didn’t even think about water having oxygen in it already. Everyone knows that, it’s just when you are deperate for a miracle, you’ll believe anything, and that’s what these scammers depend on. Just from your nasty response to Mr Jay, I will no longer visit your site…you have to be the worst health professional I’ve ever encountered…at least the worst mannered. I completely agree with you R. Jay, in that the review seems completely biased with a rather hateful tone. I have one word that will explain many or all of the positive comments! PLACEBO! that is all. What are the chances that multiple people from different walks of life would all have a positive experience from using a product? Must be something to the science. Can you rebut any of them and back it ip? Just because he says it’s a scam does not make it true The point of a discussion is to have information and opinions from more than one person. NutriO2 mahy be a scam because it is overpriced or perhaps does not work as mira.acuolously as it claims, but that does not mean that the principle is a scam. I might consider this product, but………Only, if it were banned from use in the Tour de France ! I’d like to add, I took this product because my body was asking for it, not knowing what to expect. So, I cannot say that this was a placebo effect for me. As I mentioned in my post above, I have gotten miraculous results from using this product. As with all of my nutritional supplements, I only take this on an as needed basis. Even a good product could be “bad” for you if you take it when your body is not asking for it. Some people think Applied Kinesiology (muscle testing) is voodoo as well. I thought it was crazy when I first started, but it has literally helped to save my life. I had Candida Albicans so severe I’m lucky I didn’t die from it. The breakouts of rash were very possibly Herxhemer reactions in which the amount of toxins being release was too much for the normal elimination systems.. In such cases the toxins cause skin eruptions. You can look up and read about Herxheimer’s reactions. For Candida Albicans, you need to use either colloidal silver or a liquid boron supplement to kill it off. If it is affecting the skin, you can also apply a mild solution of Boric Acid. Thank you for your input regarding nutrio2. 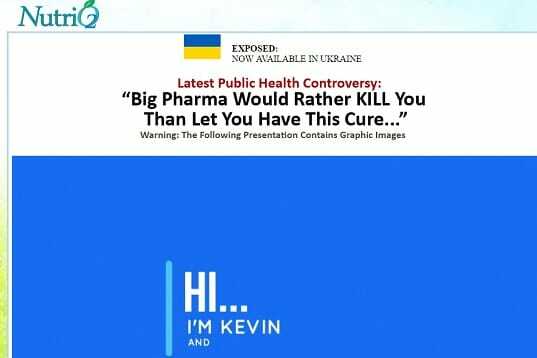 This kind of deception is what will be used to shut down real natural health products which pharmacy Industry would very much like to do. Agreed. No profit in cures. Oh, you’re quite mistaken. Big bucks in meds, like for HIV. Whoever really finds a cure for cancer — or even a better cure for baldness — will be rich! Oh, and this UNPROVEN product — no published clinical trials in any major medical journals — is a”real natural health product”? Gee, then I shouid try rubbing poison ivy, poison oak and poison sumac on my skin or drink it,like tea? Too much oxygen alcalises the blood and you develop all the symptoms of hyperventilation. The reverse is true:. lower the amount of oxygen and increase the level of CO2 to get a better absorption of O2 in the tissue cells.. This phenomenon was discovered by Dr. Konstatin Buteyko. This is how the yogi’s in India lower their heart rate and can sit for several hours without breathing:, their level of GABA increases. The only liquid oxygen product i have seen that can be taken orally as a medicine is food grade hydrogen peroxide. Can buy over the internet a lot cheaper. Need to use caution and follow some strict protocols with it, which are also available on line with a good search engine. I am questioning your remarks about the stock photo. I bought from Natural Healing their Meridian exercise and basic work book in the video Kevin is part with Master Lim – so it cannot be a stock photo!!! Otherwise your comments are interesting but did not convince me 100%. You clearly didn’t click on the link to the Shutterstock image. Did you even read the review? Don’t think so. What credentials qualify you to evaluate this or any other similar product??? Are you a General Practitioner or specialist? Where do you practice? Great service to the community, many of whom are desperate to find “the cure.” Amazing these charlatans aren’t shut down sooner than later. They belong in prison. Everything you say about Nutri02 is correct. It’s a massive con job. However, some of your comments about oxygen are far off the mark. For example, it’s easy to find ‘lung function’ charts on the internet. They show how lung function decreases with age. Lung function is the lungs’ ability to absorb a given amount of oxygen from every breath you take. By age 70 that about has halved as compared to age 25. So, the older one gets the less one’s lungs are able to absorb oxygen. Therefore the ‘need’ for more oxygen – as a ‘suppliment’ – increases with age. Increasing oxygen intake will without doubt slow down the ageing process. Let us know if you find a better product. Oxygenated water is useless because you get all the oxygen you need from the air, if you are healthy. The amount of oxygen supplied by oxygenated water is negligible. Your body would absorb the oxygen, but it wouldn’t be enough to make any difference. Hyperventilating would be more effective at increasing your oxygen levels, but that’s not healthy. Your body is very good at balancing things: not too much, not too little. Often th things that people do to meddle with this are stupid. Oxygenated water is a great way to get foolish people to spend big bucks unnecessarily. It’s unhealthy for your wallet, which can be unhealthy to your body. Get medical advice from a doctor. Ignore people trying to sell you “healthy” crap. Water with H2O2 added is a form of ocygenated water, and it definitely works to put additional oxygen into the tissues of the body. The same is true of MMS (miracle mineral supplement), which uses socium chlorite activated with citric acid to put hydrochlorous acid into the body. MMS has been used as a cure for Malaria and will work on cancer. I have personally observed H2O2 cure cancer. Getting medical advice fro a doctor is not always the best thing. The guy who writes the reviews on this web site says he is a medical docter. I have a medical doctor friend who bailed out of the system She says that in the US around 600,000 people per year die from medical errors and/or from imposition of the AMA “standard of care” when it is not necessary. Thanks Bob for mentioning the MMS–I already have some and it is very inexpensive. I haven’t been drinking the regimen though, so I didn’t realize it did the same thing as the Nutri02 which I was considering buying. I have used the MMS as an inhalant and cleared a case of chronic bronchitis 5 years ago. I take it this way very occasionally anytime I have post nasal drip and it clears all symptoms fairly immediately. I will drink it in water after, but again I have never done this consistently. Thanks for saving me some $$$! I am a Reiki Master and Holistic healer, so sometimes I try new things that resonate to see if I can help cure myself and others. I’ve found quite a few natural cures I like! Reiki “master” — massage without touching people– & “holistic” healer? Oh, forget medical researchers or doctors with extensive training, certification & experience — I’ll listen to you, NOT! MMS is a proven scam. Lisa, what nonsense! Proven from whom?? I use it occasionally and it works always! So, what’s the alternative? Naturopaths, chiropractors, faith healers, people who claim to read irises or auras? Thank you, but I’ll rely on medical doctors who have scientifically-based training. This reviewer is appalling! S/he has obviously never tried anything but toxic Western medicine and believes this is automatically a fraud which I assure you is NOT! I have not only had first hand experience with Food Grade H2O2 which was part of a life saving regimen after being treated with radiation for breast cancer— but i also witnessed how it literally transformed the lives of many clients who came into our integrated health clinic over the course of nine years. I don’t condone the pricing of this product— it’s much too high for the average consumer but if you have health issues and are looking for an honest alternative to your medications that no longer work for you, I encourage you to try food grade H2O2. Follow the directions! There IS such a thing as over-oxygenating. I have some of this type of peroxide. How can Imsadely inhale it? The only way to get liquid oxygen is either hydrogen peroxide or water. What if it isn’t nutri02 that is the cure but to drink more water? How many people in the western world (especially in the USA) drink enough water to begin with? Ask how many people don’t want water but depend on soda/soft drinks, alcohol, tea or coffee or other high caffeinated and sugary drinks? How many of them are in chronic dehydration? Eating iron-rich foods helps bind oxygen and carries it to the cells that need it. Eating wheat and grains (including whole grains) will block absorption of minerals, including iron. NutriO2 may or may not work, but it is surely overpriced. If I had cancer, I’d rather take my chances with cannabis oil! TO THE DOCTOR WHO WROTE THIS REVIEW. .I support you but think it is only fair, as others have asked, that you provide your CREDENTIALS, MED SCHOOL ATTENDED, BOARD-CERTIFICATION, if you any. Most doctors, I would think, would also be willing to post their name or at least the hospital or institution they practice in. I ordered mine last month and it never arrived. I tried to reach him but to no avail. The emails he sent me are auto emails, the same words. I tried to contact customer service and my email address and password are correct but it always said “incorrect.” There’s no way to reach him. I ordered the NitroO2 last month and I’m still waiting on the product. I was totally ripped off. I have numerously emailed this scumbag, and all his reply’s say are ty for using my product. Doesn’t read his emails at all. I’m so disappointed and mad at myself for going for such a scam. But I was hoping it would be what I needed to help me. IF IT SOUNDS TO GOOD TO BE TRUE, IT IS TOO GOOD TO BE TRUE. It would be nice to just get a courtesy email from him. But I give up. Although I did write him an actual letter. Maybe he’ll take time to read it. I doubt it. A Very Disappointed Customer. This is for Kevin Richardson, Founder of NitroO2. After several days of using, and no difference in health or energy level, my main comment/concern is that there are no changes in my pulse oximetry levels! They’re still in the 80s unless I’m on 2L of o2! Well, this certainly appears to be a scam, but I am much more fascinated by how angry many of the commenters are. As a reminder, it is important to communicate with dignity and respect because it helps you form and relay your thought with confidence and conviction. Perhaps we could all use a brush up on mature communication from time to time. This Nutri02 is likely a scam, or mostly hype. That said I would like to point out that the O in water is not bioavailable to fish or any other organism. If it was no oxigenators would be necessary in aquariums. You have to FORCE an air mixture into the water before the fish can use it.. If you have an easy way to split H2O, tell us all about it! We can discard the O and put the hydrogen in our cars! Dr. Ossai, someone with your level of education should know this. Brilliant Jim! By your answer, you just confirmed that water does in fact contain bioavailable oxygen. That was the answer I was waiting for. Brilliant! When I was referring to water already having oxygen, I wasn’t talking about the O in H2O. I was actually talking about the DISSOLVED OXYGEN GAS in water. People tend to forget that water is the most powerful solvent on earth that can dissolve both solids, liquids and gases. As long as water is not distilled or put in air-tight containers for a long time, it will always contain dissolved oxygen. I have not yet made up my mind as to the scam or no scam of this presentation, but as to this rebuttal…..it’s not on to anything. Fish DO NOT break down the H2O and utilize the oxygen content In nature in large bodies of water, the wind rain and the large surface area contribute to oxygenation of the water from the air. The use of an airline creating bubbles in an aquarium contributes to oxygenation as the bubbles disturb the surface which facilitates oxygen transfer to the water. My philosophy….don’t be too quick to accept OR reject. Take in information, file it in memory, and when an opportunity to act on it comes about, apply it with additional research and questioning. Do not order from Kevin. He is much to bussy to answer your questions. Reminds me of snake oil salesman. So oxygen has not been stabilized in a liquid other than water? Oh and Hyperbaric chamber’s do nothing? The only way to absorb oxygen is breathing? And fish are surrounded by water which has oxygen in it and use gills to separate but we don’t have gills. And the author of this article rant has a background in ?qualifications verified by ?and yeah I’ve never used this but for someone to blindly knock something that they haven’t tried and don’t really know anything about, yeah. I’m not saying this works then again I’m not saying it doesn’t just saying that pharmaceutical companies do stick trolls everywhere because they don’t want any competition God forbid anybody finds anything that cures anything, because pharmaceutical companies only make money off of treating not curing much like your doctor, patients come back, cured don’t. Think about it people. I do not agree that brearthing supplies enough oxygem we need in our bodies, considering that only about 15% of the oxygen we breathe finally manages to reach deep in our cells, because of the various obstacles it encounters on the way. We need supplemental oxygenation. How best to supply it? I do not know!